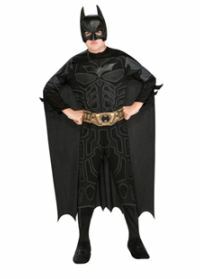 The success of the Batman movies such as Justice League, Batman V. Superman, and The Dark Knight Rises as well as the cartoon series Batman Unlimited have maintained the Caped Crusader as a popular Halloween costume theme with children today. The film directed by Zack Synder stars Ben Affleck as an older Bruce Wayne finding himself back as the Dark Knight fighting new group of villains as well as Superman. The team from the movie will return in the new Justice League movie that will be released this year in November! 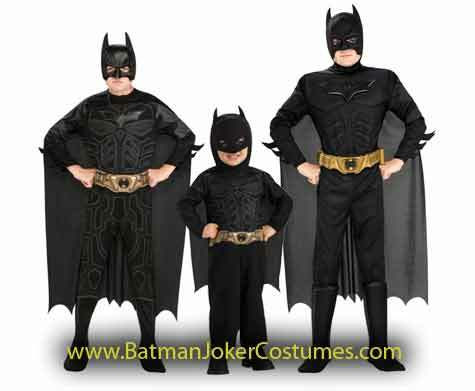 If your child wants to suit up in the new version of Batman or the older Dark Knight version, we have both styles of the kid Halloween costumes available as shown below! 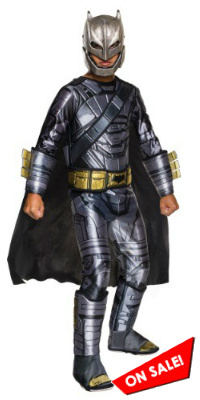 This deluxe muscle version of the kid Batman costumes include a muscle padded chest jumpsuit with boot tops, black cape, Bat headpiece and yellow belt. This deluxe child's outfit are in boy clothing sizes: Small 4-6, Medium 8-10, or Large 12-14. A new older and wiser Batman is back in movie Batman v Superman: Dawn of Justice. 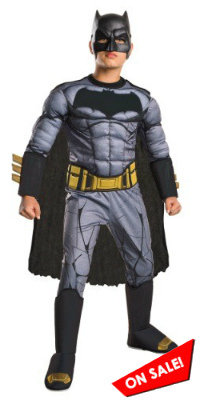 This deluxe Halloween costume for kids is based on the new superhero outfit featured in the movie. In one of the memorable action scenes in Batman V Superman: Dawn of Justice movie, we see Bruce Wayne suit up into his new Batman Battle Armor to battle Superman. 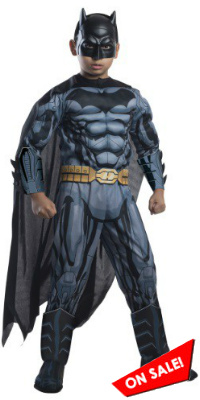 Now your child has a chance to suit up his own Dark Knight metal armor costume! This deluxe outfit recreates the details as seen in the film. 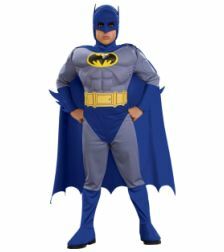 This new amazing style is based on the currently popular Batman: Unlimited cartoon series. 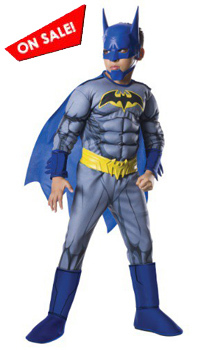 This DC Comics deluxe child costume featuresa detailed velcro jumpsuit with a soft sculpted padded chest that will give your child the superhero look you see in comics. Also includes the molded mask, foam belt, and boot tops. 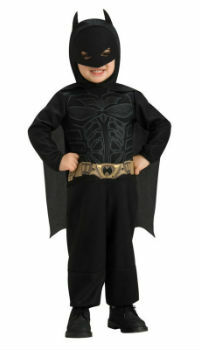 Your baby can join in the fun this Halloween with this cute Dark Knight Batman costume for toddlers. Special low price! 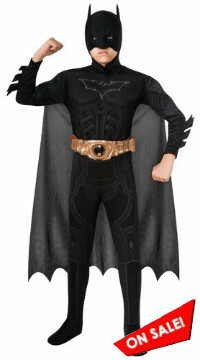 This popular kid costume features a light-up bat emblem, belt, headpiece, and cape. Only limited quanities left in stock for Halloween. 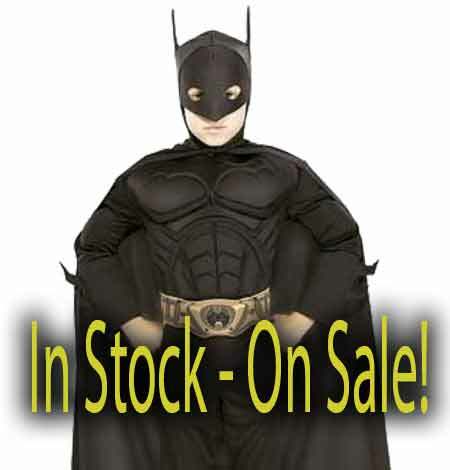 Most costumes come with shoe covers so if you prefer to enhance your child's costume, we recommend a good pair of child super hero Batman boots to give your child that extra super hero look for Halloween. 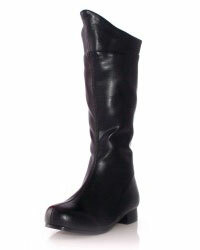 These boots are available in child shoe sizes: Small (11-12), Medium (13-1), Large (2-3), or XL (4-5). 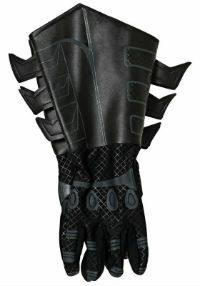 Enhance your child's Dark Knight costume for Halloween night with these pair of gloves designed like Batman gauntlets. 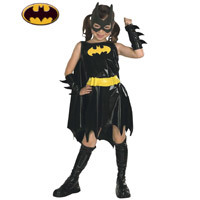 Girls can also dress up as the Dark Knight and become Batgirl on Halloween. 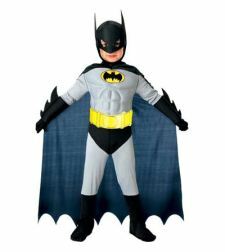 This Halloween costume is an affordable Batman costume for kids which includes a jumpsuit with printed designs and boot tops and black cape.